The Science Fiction Romance Brigade‘s blog hop is back, bringing you great reads. Great prizes, too! $50 gift cards, ebook bundles, and copies of my own Alien Contact for Idiots. More on the prizes at the end of this blog post. Whenever I have a new release, I design a travel poster for the book’s science fiction worlds. Seeing that I’ve had two new releases since April, I’m honoring of the SFR Brigade’s blog hop with my travel posters for Escapee and Future Love. Not the spectacular mountain park in Canada. Not the seaside town in Scotland, either. No, this Banff is a distant moon, the hellish but mineral-rich setting for Escapee. The teriyaki vine forest is setting for one of the short stories in Future Love. Go ahead, decide which world you’d like to visit. Unlike Virgin Galactic, which charges millions, all the trip will cost you is the price of a book. For more otherworldly trips, see the other great writers in the SFR Brigade blog hop. Ahem. What about those prizes? There are several ways to win. First, anyone who joins Ed’s World during this blog hop wins an electronic copy of Ed’s thought provoking and hilarious Alien Contact for Idiots. Ed’s World is an occasional newsletter featuring giveaways, information, new releases, and other fun. There are also great grand prizes. Three $50 gift cards. Ebook bundles. Great stuff! Enter the Rafflecopter giveaway for a chance to win a grand prize! And don’t forget to visit the other worlds from other great writers! LOVE Banff! Fun name for such a moon – and looks like a really fun story. I felt a little guilty calling my hellish moon Banff, because the national park is one of my favorite places on Earth. It’s where we honeymooned, and I’ve been there dozens, probably scores, of times. 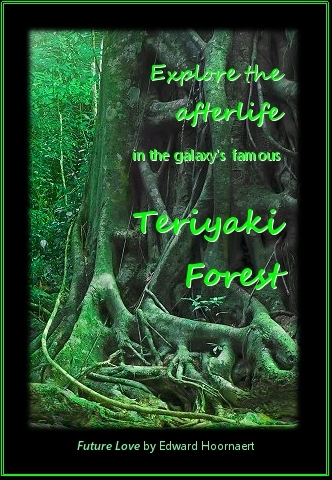 The forest is so named, if you must know the truth, because I like teriyaki chicken. Creating travel posters is a great idea! I stole the idea from NASA/JPL. They’ve created a number of cute travel posters for various planets. Check them out. I love that you create travel posters for your stories! Such a great idea! My son would love Banff, as he wants to be a volcanologist, but I’d rather visit the Teriyaki Forest. I think. I may change my mind after reading the story. Just checking: that’s volcanologist, not vulcanologist, right? Seeing as you write science fiction, either is a possibility for your offspring. What great posters, but I don’t think they encourage me to travel to those places, lol. I love your travel posters! And they could easily be made into trump cards perhaps – do you have those? Nothing to do with Donald, I’m pleased to say. I’m familiar with cards that can be used to trump other, as in bridge, but it seems your implying something else. I have to admit ignorance of what a trump card is — sorry! Wow travel posters! Fun ideas. I’ll have to check the NASA site. Posters fit well with my graphics capabilities. Anything fancier or bigger and I’m in trouble … though I have done a few of my own covers. My first exposure to the African Queen came from the TV show Muppet Babies. I know they took many liberties with what they thought the plot was, but I didn’t think to go look for the source material because I was nine. It, and Escape to Banff, look like a corker of an adventure! The Muppet Babies did a version of The African Queen? Now that I did not know. Yes! Looking it up, the episode is called The Air Conditioner at the End of the Universe (there’s a power outage), and Miss Piggy fancies herself Katharine Hepburn. i love the posters and that is such great branding, the African Queen in space! I love it! The plot’s structure and turning points are all inspired by an analysis of the movie. My characters are fairly different, though, and more developed (as you’d expect in a book as opposed to a movie). Actually, they’re more developed than in the original book, too. CS Forester, who also wrote the Hornblower books, was more interested in the boat than in its passengers. I lovelovelove your travel posters! I’m in the process of commissioning posters for my worlds, too, and they just make me full of happy inside! I know what you mean about happy inside. I’ve been writing for 25 years, yet I still keep framed covers from my first three books (Silhouette romances) on the wall of my office. Love the posters! The African Queen is one of my favorite movies. Mine too. When young, though, I remember thinking that Humphrey Bogart sounded totally, thoroughly unCanadian; he was supposed from Victoria. There are more short story collections around now than there used to be. Big commercial presses rarely bothered with them, but with the proliferation of small presses and self-publishing, more of them come to life. I adore these travel posters!! Great idea!! Thanks. I’m quite proud of them myself.